Ready to invest in your very own stand up paddle board? Instead of buying one of the solid boards, do yourself a favor and get one of the lightweight inflatable SUPs. You will end up with a quality board that has a low price, is easy to store and transport, and that works well. Personally, I prefer inflatables to the rigid stand up paddle boards and find that that 10-foot boards offer the best value in terms of price and versatility. Often, this side is the best value iSUP for the money and many of the models come with paddles and pumps, which saves you even more money in addition to the already low price. 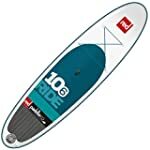 So, if you are looking for a cheap inflatable stand up paddle board that will meet your budget without skimping on quality, let me share my top picks when it comes to new 10-foot inflatable stand up paddleboards in 2017 – 2018. Overall, this iSUP is probably my top pick when it comes to the best iSUP for beginners. Paddle boarders who are just getting started, as well as those with intermediate level skills, will find that this board maneuvers well in the water. This high quality board has a low online price and comes with a 3-piece adjustable paddle and a hand pump – that is everything that you need to get started today! The weight limit for this board is 350 pounds, which means that you can take out your dog or your kid with you. Or, two adults who do not exceed that limit. 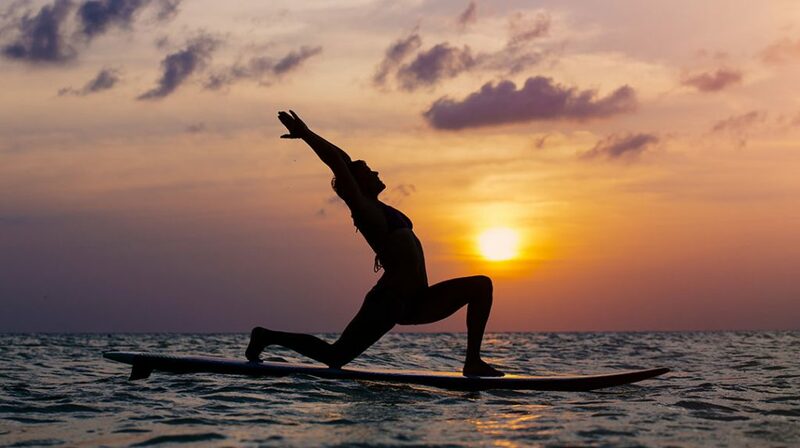 It is great for all types of paddle boarding, from surfing to yoga to flat water paddling. You’ll find that it is easy to balance on this one as it has a wide 32-inch stable base and it a thick 6-inches. When you’re done for the day, just deflate it and roll it up to fit in a carry pack for easy transport and storage. This one is a good choice for kids, teens, women, and travelers who want something small, lightweight and compact. However, the paddle that comes with it isn’t that great. We suggest buying yourself a new one to replace it. Just Paddleboard has a list of the top SUP paddles that you can use to find a good one. Check out our Tower Adventurer 9’10” Inflatable SUP Review for more details on this super affordable inflatable SUP. If you enjoy the Tower Adventurer above but prefer a board that is even more lightweight, then your best option is this Isle inflatable SUP. You get the same basic gear – board, paddle and pump – at a similar price. This one is also of excellent quality. Basically the only real difference between the two has to do with weight – both weight limit and the weight of the actual iSUP. The most important difference to note is that this Isle iSUP has a weight limit of just 200 pounds. This means that bigger people cannot use this one and it is also difficult to take out two adults on this one and stay within the weight limit. You also get just a bit more stability from this board because it is wider than the Tower Adventurer. It comes in at a width of 36 inches. This board maneuvers well, like the Tower, and really has no other differences. It is also a great iSUP for beginners. Worried about the cost of a new iSUP? If so, then the Solstice Bali is the best stand up paddle board for someone on a budget seeking out the most affordable iSUP for the money. This one has a lower retail price than the Tower Adventurer and the Isle above, but offers similar quality. Though you’d think that the cost of this iSUP would mean that it’s bare bones, but it’s not! You actually get MORE accessories with the Solstice Bali that the two listed above! You get a pump, a three-piece paddle AND a carry bag for it. Not too bad, eh? You will also notice in the image that the paddle has an ergonomic “T” handle, which makes the paddle comfortable and easy to use. So, you’ve heard of paddle boarding and are ready to give this exciting water sport a try. We don’t blame you. It’s lots of fun to do. Well, it’s fun for those who have already experience some of the fun. If you are new to the sport of stand up paddle boarding, well you might have some trepidation. That’s understandable because you might be concerned about spending more time in the water than on top of your SUP. As a result, much of the worrying comes from how to purchase the proper SUP itself. There are so many options out there. So many things to choose from. Sometimes it’s hard to know what makes a good purchase, versus a bad one. Well, we are here to alleviate these concerns. Everyone is a novice, at some point in their life. We are here to help you find the right inflatable SUP for you and your friends. Below are 5 tips to selecting the perfect iSUP for your water sports needs. 1) Some make the mistake of asking which board is the right board. The better question to ask involves the type of boarding you want to do. The type of boarding you want to do can either make or break the right choice. Be advised that there lots of different categories. Once you figure out what sort of boarding you want to do, you can then choose the proper category. Below you will find the most common categories in the SUP family. These are the most sought after SUPS. Figure out the category and start window-shopping. 2) What size should I get? This is the next question we commonly get from people. The answer depends on two things. It depends on your size. It also depends on your experience so far on the SUP. Try to get one that has more volume and is thicker. The idea is to downgrade the volume and thickness, as you get better with the paddle boarding. The more experience you gain, the more stable you will become on your SUP. 3) The inflatable ones and the epoxy are the two main choices. However, it’s in your best interest to go with the inflatable one. You need something that is durable and ultra portable. You also need something that can store easily. You won’t be using it all year round, so don’t expect to. Inflatables are also perfect for those limited on the space. The other ones are viable, but you will need at least 9 feet of space to store. The inflatable one will work in all kinds of conditions. It won’t have the pre-conditions the others have attached to it. 4) When it comes to the inflatable stand up board, you will need to store it inside. This will reduce the likelihood of damage. It’s also going to reduce the chances of outside stuff getting to it. Yes. It’s especially true for the inflatable ones. All you do is deflate and hide it away. We mention this because some fail to do this. Many just assume they can hide it under the table on their deck. You shouldn’t. The more damage you expose it to early on, the less of a lifespan it will have later on. When it comes to your SUP, you always need to be thinking ahead. 5) The final tip is involved in the pricing. You are going to have to peel back the layers on this one. It’s time to look beyond the marketing exploits, exploits which many companies rely on. The marketing is just the smokescreen. You have to take a look at what the company is offering you, personally. What are they going to give you for the investment. The price, guarantee and the customer service are the three main things you need to look at. a) The price should always be something that fits your budget comfortably. As you will discover when you compare iSUPs, there is a lot of variation in price so go with something that you can easily afford. b) Try to go with someone offering the free shipping. Shipping should be the last thing you consider with this. c) There should be some sort of guarantee attached with it, like 30 days free or return it for a full refund. If you don’t see something like this, then you are not buying the right one. d) The customer services needs to be easy to reach and responsive to inquiries. You definitely want to be able to get good support, if you end up need it. The more research you do on this, the better of an investment you will make. 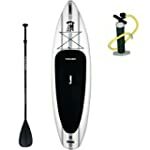 And remember, there are plenty of all-in-one package deals where you can get yourself the inflatable SUP with some added accessories like a paddle, pump, carry bag, or other items.